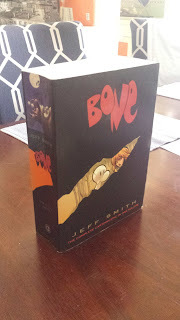 Jeff Smith founded Cartoon Books as a means of independently publishing his "Bone" comic book series. It is a nod to Carl Barks' "Uncle Scrooge" and answers the question: Wouldn't it be cool if Uncle Scrooge had a twenty year long adventure? As lushly illustrated as the title Bone-cousins are simple, the complete Bone series is a masterpiece, but anything as influenced by Walt Kelly and Tolkien and Tolstoy as this story is bound to be at least interesting. I'm lucky enough to be in possession of the door-stopper complete collection, seen below. The sadness creeps in as the story is wrapping up, because you just want it to continue. This is a story and creator I've suggested to people who harbor specific negative views of the comic industry and its super-hero mainstream.